I’ve read two other books by Yan Lianke: Dream of Ding Village (2005) which was an indictment of China’s scandalous blood collection scheme, (see my review) and Lenin’s Kisses (2003) which mocked China’s get-rich-quick entry into capitalism (see my review). Lianke, living and writing in China, is a scathing critic of his society but although his works are censored, he (unlike other Chinese writers in prison or in exile) has so far avoided curtailment of his personal liberty and freedom to write. As expected, the authorities have prevented publication of the book in mainland China. In 2010 it was first published as Sishu in a small print run for friends and colleagues in Hong Kong, but is now enjoying a wide readership outside China since its translation into English by Carlos Rojas (who also translated Lenin’s Kisses). It is sad to think that ordinary Chinese cannot know their own history, an ignorance foreshadowed in the novel when the hapless members of the brigade try to find out if the famine is localised, or affecting the entire country. They never do find out, and their naïve belief that the higher-ups would surely send food if they could, is only one of many sharp ironies in the novel. The four books of the title refer to four interwoven narrations. The characters of the novel are never named: they are designated The Child (who is in charge) and the members of the 99th Brigade, sent for re-education through labour because of their crimes (i.e. being, by definition, pro-Western because they are intellectuals). These intellectuals are, amongst many others, the Theologian, the Philosopher, the Linguist, the Musician, the Scholar and the Author, and it is the author who writes the excerpts from ‘Criminal Records’ – a journal written at the behest of the Child and denouncing the other members of the brigade for various incriminating behaviours. The author is also secretly gathering material for his novel, to be written after he is released, and these excerpts are called ‘Old Course’ (alluding to the old ways of doing things, which are of course, strictly forbidden in Mao’s China). There are also fragments from ‘Heaven’s Child’, an anonymous work that tells the story of the Re-Ed Compound with religious and mythological overtones, and the final chapter is an allusion to endlessly unachievable tasks called ‘A New Myth of Sisyphus‘ which purports to be a secret manuscript written by someone else in the compound. It may sound unnecessarily complex or confusing, but it’s not. Each excerpt reads smoothly, and it’s not at all complicated. In fact, the plot is almost too simple. It follows what happened in real life. Pushed by insane targets, people with no farming expertise destroyed the arable land, then mined it to try to reach insane industrial targets and then the famine struck. Lianke uses satire to show how this took place. Emulating the higher-ups, the Child institutes an absurd system of rewards and incentives to encourage higher productivity. Only it’s not higher productivity – it’s reporting of higher productivity. At the beginning of winter, those who reported production of more than six hundred jin of grain per mu of land were praised, whereupon they all proceeded to the county seat to receive their awards. There the Child reported six hundred jin of grain per mu. This was a large figure, but there were also some people who reported as much as sixteen hundred jin. The award for those reporting one thousand jin was an iron shovel, and for those reporting fifteen hundred jin the award was a shovel and a hoe. Those reporting more than two thousand jin would also receive a flashlight and a pair of rubber rain boots, and for every additional hundred jin over three thousand they would receive another foot of muslin fabric. As a result, everyone started reporting like crazy. Some reported five thousand jin, others reported ten thousand and one person even reported having produced fifty thousand jin per mu. Each successive directive from the higher-ups is treated the same way, with the hapless brigade trying to achieve the unachievable and going to extraordinary lengths to achieve it, while at the same time, what matters is not what is produced but what is reported. The disaster as it unfolds is chilling reading. 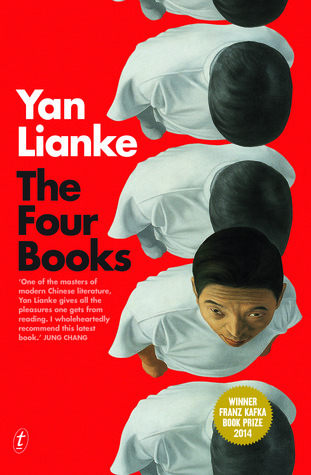 The Four Books is a remarkable novel which brings to life an event which I knew about only in the abstract. Somewhere between 15 and 45 million people died in that famine, and the sometimes biblical tone of the ‘Heaven’s Child’ narrative reminds the reader of those Old Testament disasters inflicted by a vengeful god. Mao thought he was a god, but in reality he was one of the most evil men in history and under his dictatorship his policies resulted in more deaths of his own people than almost any other tyrant. There are plenty of reviews around: I liked this one from The Financial Times. I like the sound of this (the satirical elements sound almost similar to Magnus Mills’ work) but seeing as I’m still to read Lenin’s Kisses (it’s been sitting on my shelf unread since hardcover publication) it could take me awhile to get to. What a thorough, fact-filled, insightful review that added to my own knowledge even after reading the book. My review is more superficial, more of a reaction to the terrible absurdity of the situation, but I like your review much better.